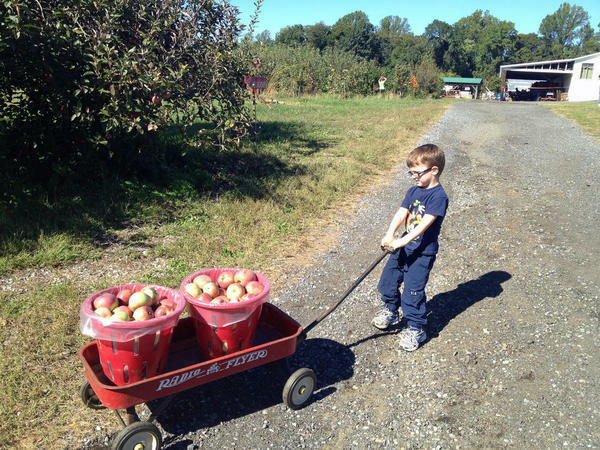 Living in New Jersey, the coming of autumn practically mandates a trip to a local farm to pick apples and pumpkins. As part of my son Jude's home school curriculum, I combined the story How to Bake an Apple Pie and See the World by Marjorie Priceman with a trip to a local farm to pick apples. Together we picked just over 24 pounds of Empire apples. He had such a good time that our family decided to go apple and pumpkin picking again a few days later. 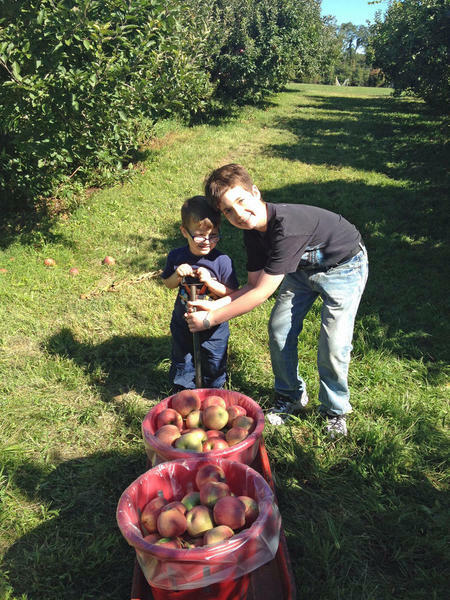 This time Jude and big brother Luke combined forces to pick another 40 pounds of apples, concentrating their efforts on the McIntosh trees. 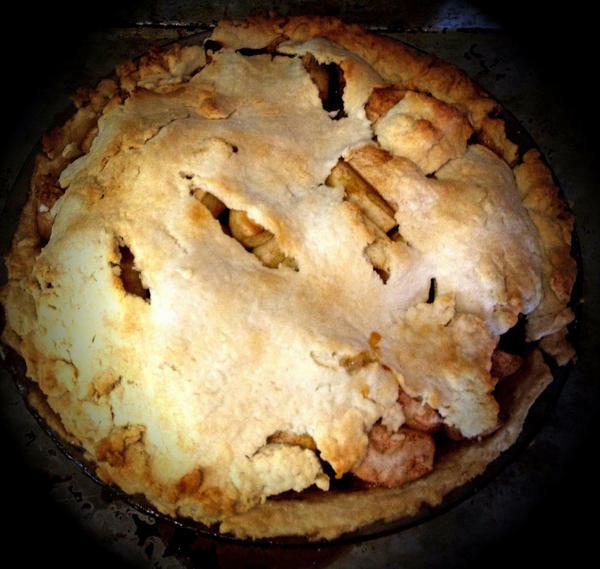 We started off using the apples by making an apple pie, but there is only so much pie one little boy should eat. I decided to preserve the remaining apples as apple chunks (to be used in future pies) and applesauce. 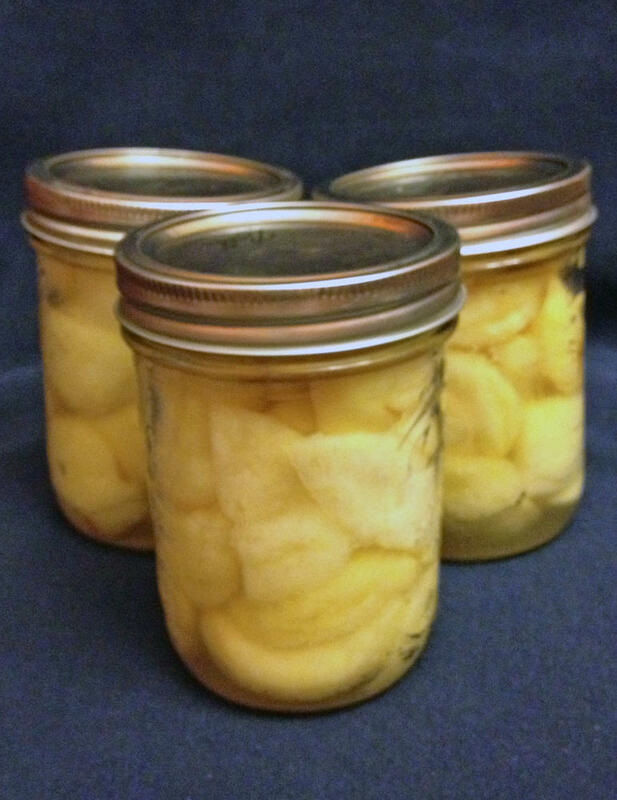 While canning foods is an old-fashioned method of preservation, there is something that remains thrilling about opening a jar of home-canned fruit in the middle of winter. There is also an added bonus that since we made it ourselves, we know what is in it and that it is safe for my food-allergic children to eat. Watching our mothers and grandmothers make dinner is how most of us learn to cook. I am often at a loss when my children ask me to tell them how I cooked something -- I tell them that I just watched and helped my mother make that dish so many times that I just do it by instinct. It is important to me that my children learn how to cook. It's not just a life skill that they "should" learn, but one that they MUST learn, because with their allergies, the stereotypical "Bachelor Take-Out" meal plan isn't going to work. Jude has already spent a lot of time in the kitchen watching us, and while he needs a lot of supervision and assistance, he is now old enough to graduate from just watching to actively doing some small prep tasks. 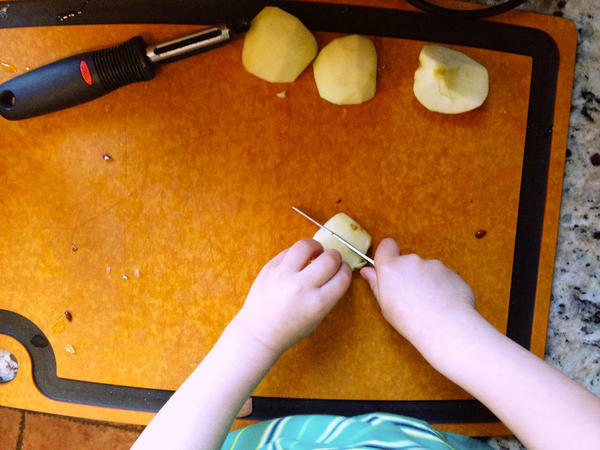 I know that the only way to get good at something is to practice, but I must also admit that handing your five-year-old a peeler and a knife (even if it's only a small paring knife) is also a little scary. He did not have the dexterity to peel the apples, but was able to grip the knife and cut the apple halves and quarters into smaller pieces. I showed him how to make a "bear claw" with his "helper hand," so he could hold his apple piece steady while cutting. He was very proud to count all five fingers after placing the pieces in the bowl; I was relieved he didn't stop counting after three or four. We then started in on applesauce. It is one of Jude's favorite foods as well, so he was excited to make it "by himself, with help." Again, he got to be my sous chef, doing small but important tasks. He helped quarter the apples to cook them, fed them through the food mill, placed lids on the filled jars, and refilled the electric kettle to add more water to the canner. I don't think he is quite ready to cook a whole dinner, but by the third or fourth canner load he knew what to hand me before I even asked. He also got enough practice with the dishwasher that he can independently put away the clean dishes that go in lower cabinets and restart the appliance after a grownup reloads it -- cleaning up skills are just as important as mess-making ones. On our first day of canning, we put up nearly all of the Empire apples from our first trip. In addition to our pie (that daddy declared, "Delicious! 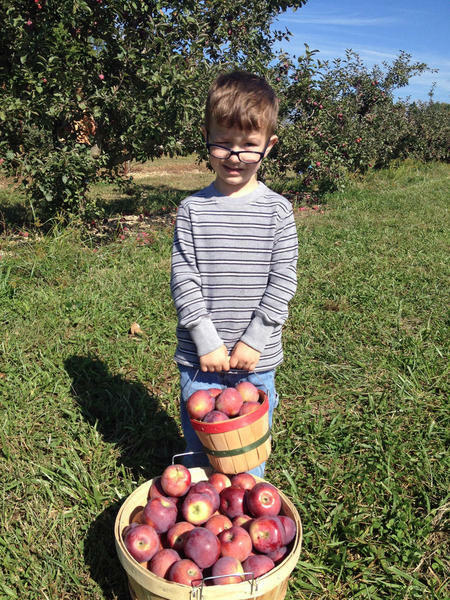 "), we preserved nine pint jars filled with apple chunks and four pints of applesauce. On day two, we started the McIntosh apples and created another six or eight pints of chunks plus 20 pints of applesauce. He is very proud of his work. We are all looking forward to an apple pie at Christmas made with "Jude's apples," and a cold, snowy day in February when we can pop open a jar of applesauce with our dinner and say, "Jude made this." Sift flour and salt together. Add the lard to the bowl and place in refrigerator for 20 min. Remove from fridge. Using fingertips or a pastry cutter, gently work the lard into the flour until the bits of fat are pea sized or smaller. Sprinkle the vanilla extract into the flour/fat mixture, working it gently in until dough begins to come together. (It will still be dry with loose flour.) Add water (not the ice), about half a tablespoon at a time, until the entire mass comes together into a ball. (You may not need the entire amount.) Wrap dough in plastic and chill in refrigerator for 30-60 minutes. Remove dough from refrigerator. Divide in half, and roll dough to fit your pie pan. Line pan with dough. Roll out other piece for top crust. *Any all-purpose wheat flour will work for this crust. I used White Lily brand (often used for southern-style biscuits) because it is made with a "softer" wheat and produces a more tender crust. **You may substitute any safe solid fat (butter, margarine, shortening) for lard if desired. Mix sugar, cinnamon and fruit together, and pour into pie pan prepared with half of the crust dough. Dot with butter, if desired. Place top crust on pie, and create small slits for steam to escape. Crimp edges, and place on baking sheet. (The sheet will catch any overflowing juices.) Bake at 425*F for 50-60 min. Peel and core apples. Place in a large stainless steel saucepan/stockpot, adding water or juice to prevent sticking. Bring to a boil over medium-high heat. Reduce heat and simmer gently, stirring frequently until apples are softened (5 to 20 minutes, depending on variety and size.) Remove from heat and let cool slightly, about 5 minutes. Puree apples, using either a food mill or food processor for smoother applesauce, or a potato masher for chunky applesauce. Return to saucepan. Add sugar, if using, and lemon juice. Bring to a boil over medium-high heat, stirring frequently to prevent sticking. Remove from heat and allow to cool if you are going to freeze or eat within 3-5 days. Maintain a gentle boil over low heat if you are going to preserve in jars. Prepare boiling water canner. Heat jars, lids, and canning funnel (if used) in simmering water until ready for use. Do not boil. Set bands aside. 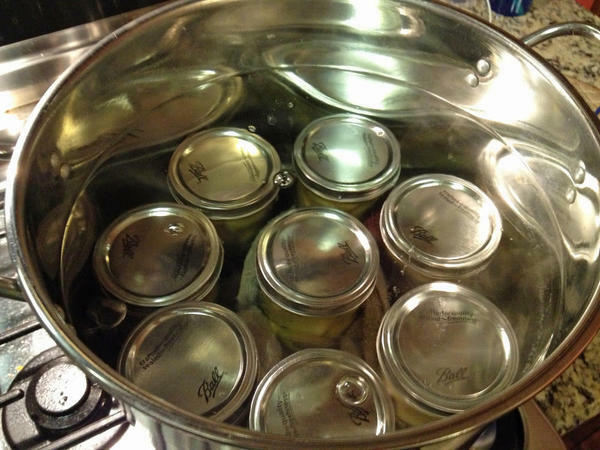 When canning foods, please consult the USDA's Complete Home Guide to Home Canning for safer and better quality food. 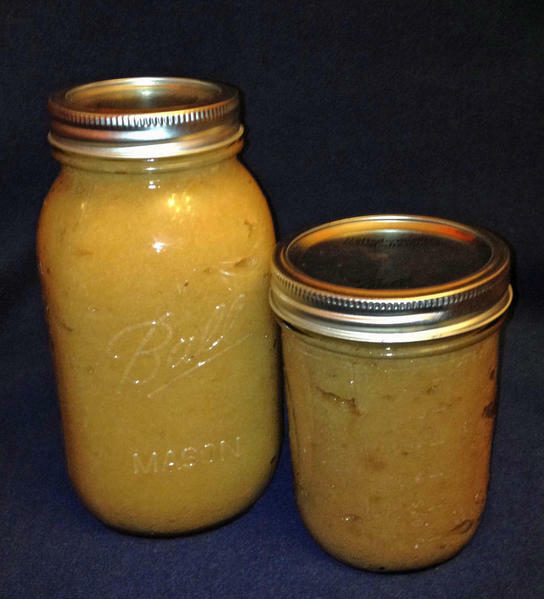 It is available for free online from the National Center for Home Food Preservation. 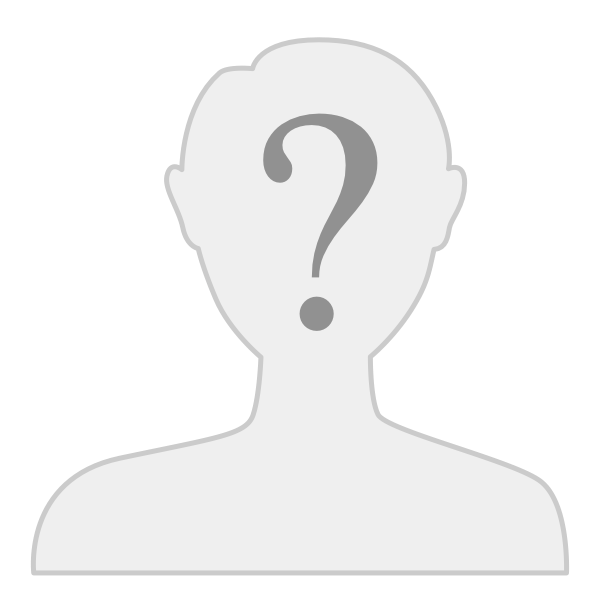 Meg Falciani has been a member and community volunteer for Kids With Food Allergies Foundation for seven years. She is the mother of five children and manages various food allergies and related conditions. What a sweet story this is. Being a mom of two boys myself it made it even more special. Thanks for sharing. Sending hugs your way.